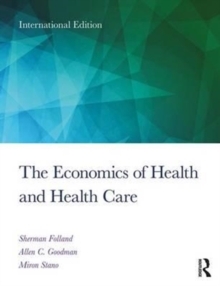 Folland, Goodman, and Stano's bestselling The Economics of Health and Health Care text offers the market-leading overview of all aspects of Health Economics, teaching through core economic themes, rather than concepts unique to the health care economy. The Eighth Edition of this key textbook has been revised and updated throughout, and reflects changes since the implementation of the Affordable Care Act (ACA). In addition to its revised treatment of health insurance, the text also introduces the key literature on social capital as it applies to individual and public health, as well as looking at public health initiatives relating to population health and economic equity, and comparing numerous policies across Western countries, China, and the developing world. It provides up-to-date discussions on current issues, as well as a comprehensive bibliography with over 1,100 references. Extra material and teaching resources are now also available through the brand new companion website, which provides full sets of discussion questions, exercises, presentation slides, and a test bank. This book demonstrates the multiplicity of ways in which economists analyze the health care system, and is suitable for courses in Health Economics, Health Policy/Systems, or Public Health, taken by health services students or practitioners.